Many gardeners grow their vining plants and let them trail across the ground, just because it's habit and they've always done it like that. 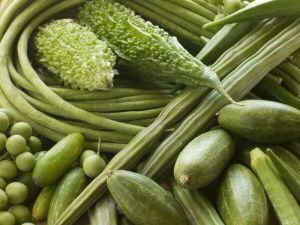 People are discovering, though, that there are many benefits to growing garden plants such as cucumbers, squash and watermelons vertically instead. Not only do your plants take up a smaller footprint, but they are less susceptible to disease and fungal growth because of the extra airflow; fruits are cleaner, more uniform in shape and easier to harvest. Follow these six fantastic tips to get started growing your cucumber plants vertically on trellises! Cucumber plants come in two different varieties: a bush plant and a vining plant. In order for your plant to grow up and over a trellis, you need to choose a variety that grows vines and will attach itself to the structure. One other nice benefit, per Bonnie Plants, is that vining cucumbers have higher yields than the bush varieties. One of the first things to consider for your trellis is the actual shape or design you'd like it to have. When choosing a design, keep in mind the space limitations you're working with, the aesthetic you'd like to maintain in the garden and what functions are important. 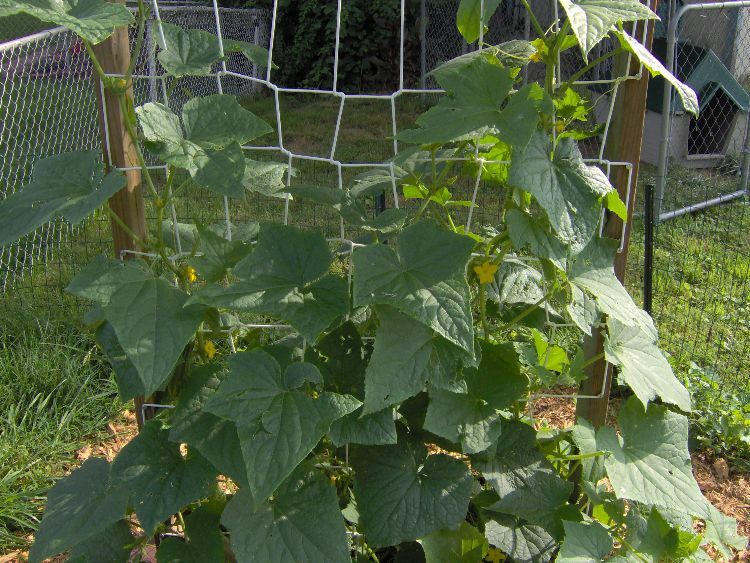 In small spaces, you could use a simple vertical wall trellis, but cucumbers will be harder to find and harvest. 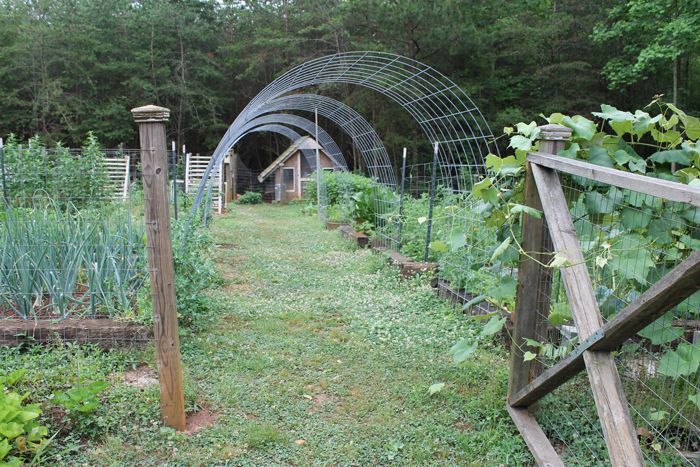 If space allows, an arch or A-frame may be a better option to make harvesting easier. 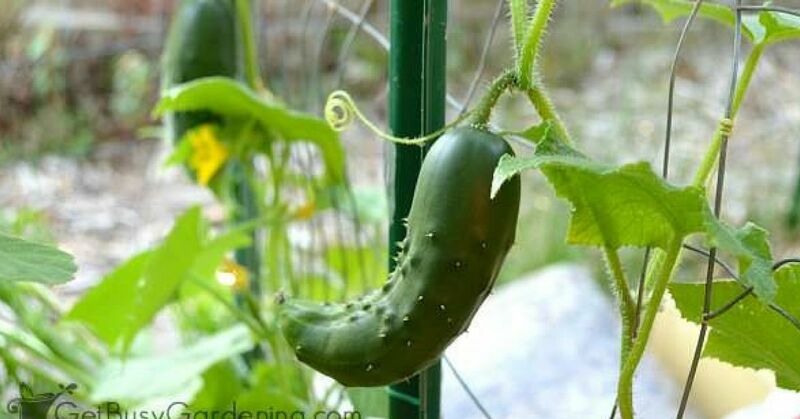 Get Busy Gardening has great instructions detailing how to build your own cucumber arch trellis. Take into consideration the materials your trellis is or will be built from. 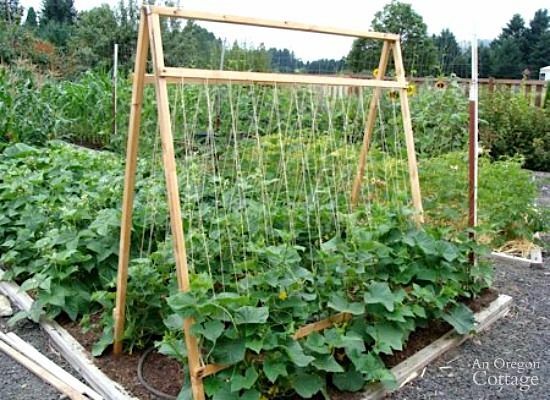 To keep it from buckling or even possibly breaking under the weight of fully formed cucumbers, you need a trellis capable of withstanding the weight -- perhaps something made with a solid wood frame. Use metal cattle fencing or PVC pipe if you are constructing it yourself. If you are building an A-frame or arched trellis -- or even purchasing one -- keep in mind how high the final trellis will be. You don't want it to be so short that you have to stoop down to harvest mature cucumbers, nor do you want it so tall that you need to get out a step ladder to reach the fruit! 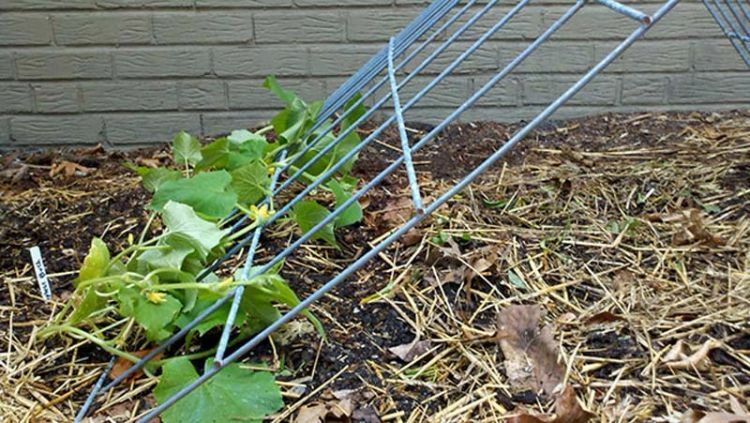 One benefit to vertical gardening is you can plant cucumber plants a little closer together than the recommended spacing if you are using a trellis. Modern Steader helps explain the importance of plant spacing when designing your garden layout. Because trellised plants aren't competing as hard for resources such as light and surface area of the ground to spread their vines, they can be put a little closer than normal -- but remember that they will still be competing for nutrients and water within the soil. You can even put plants on both sides of the trellis! After plants start growing, they may need a little help to train them to grow up the trellis. When the vines get to be long enough, begin wrapping them gently around the trellis supports. If necessary, gently tie the vines to the trellis or use plastic garden clips to prevent damaging the plant stems or restricting growth.